More often than not, new technology supplements current business practices causing incremental improvements over time. Productivity tools such as Google Docs grease the wheels of collaboration. iPads supplanting cumbersome laptop computers make document accessibility that much easier. It is only on rare occasion that a technological advancement changes an entire industry. Enter InstaScope – a portable Wideband Integrated Bioaerosol Sensor (WIBS). The key feature of InstaScope is its ability to detect mold in real-time. For the first time, mold can be detected within a wall cavity, flooring system, HVAC or ceiling without the need for invasive cutting or demolition. Further, results are presented within minutes instead of days allowing property managers and decision makers to take action immediately and without delay. At ServiceMaster NCR we saw the opportunity to use InstaScope to improve our business and provide a better product to our customers. Initially, we used the device to passively test the air for mold spores. This gave us real-time results, which was a significant improvement in its own right, but it wasn’t until we discovered that the instrument could be used to detect mold in interstitial cavities that we realized the true game changing nature of the technology. By lightly vibrating the wall we can cause a brief disturbance in the mold colony that would allow spores to be released and pass through the C-channel or wall outlet. The resulting spike in the readings allows the operator to map out the mold distribution and essentially locate the growth. Impartial, instrument-based analysis prevents personal agendas and prejudices from influencing the interpretation of air samples, and guarantees 100% continuity regardless of the operator. Elimination of an off-site laboratory from the chain of custody removes human error from the process and turnaround time has experienced a logarithmic reduction— from days to seconds. Real-time inspections with an active data display help to isolate areas of concern, i.e. HVAC involvement, hidden cavities, floor coverings, etc. This often negates the need for exploratory demolition work, which can be costly and may result in the loss of use of an area. 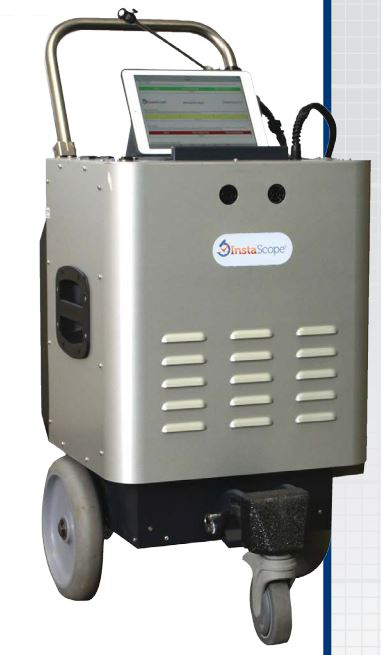 Combined with innovations in mold remediation that allow for a 90% increase in salvaged material, the InstaScope has taken the average downtime and loss of use on a mold project from 8 days to 1.5. The positive impact on project timetables and client perception is immeasurable and is borne out by numerous case studies. Though we currently use InstaScope to detect airborne particulate and mold, there are additional improvements to this technology currently under development. These improvements include the ability to detect and measure airborne bacteria – a capability that will have obvious applications in healthcare and food production facilities. We are excited about the many applications of this technology and its impact on building health.